The World Health Organization has now officially declared bacon to be just as dangerous to human health as tobacco cigarette smoking. WHO has made the decision to declare all processed meats “carcinogenic to humans,” and that’s not a good thing. The World Health Organization officially classified processed meats as carcinogenic in October 2015. The decision managed to be made by something called the International Agency of Research into Cancer (IARC), based on a review done on 800 studies globally. “Meat consists of multiple components, such as haem iron. Meat can also contain chemicals that form during meat processing or cooking. For instance, carcinogenic chemicals that form during meat processing include N-nitroso compounds and polycyclic aromatic hydrocarbons. Cooking of red meat or processed meat also produces heterocyclic aromatic amines as well as other chemicals including polycyclic aromatic hydrocarbons, which are also found in other foods and in air pollution. That means it isn’t just bacon, but any processed meat that could be potentially cancer-causing. According to Reporting The Truth, WHO made the decision to bacon and other processed meats in with the ranks of other notoriously carcinogenic substances such as asbestos, arsenic, cigarettes, and alcohol. As a matter of fact, this decision and subsequent story is all based around a fallacy: an appeal to authority, the authority of the WHO. Often, the WHO, CDC (Centers for Disease Control), and other government organizations have the ability to cause a media outcry based on nothing more what they say. The WHO has no genuine intention of keeping people healthy, being some altruistic force to make sure people don’t get bowel cancer. It would be naive to think that’s why they exist. At the root of this story, the WHO and health organizations are justifying their existence by issuing warnings about things like this. The WHO has a surface level, where they disclose to the public what they are researching and try to justify their existence with little warnings like this, and then they have a deeper depth of what they do and who they endorse, what research and products they promote, and all the rest. 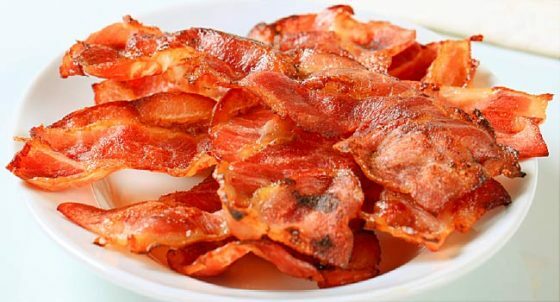 The truth is, almost everyone knows bacon is not a “health food.” It isn’t a vegetable and it’s loaded with fat. It’s not the best food to eat and because of that, most people have the common sense to not eat a pound of it at a time.